Jotron’s RCMS (Remote Control and Monitoring System) not only let the users monitor alarms and real time BITE information, but is a complete radio test and measurement system that allows the technician to remotely do complete qualifying measurements just as easy as if he was physically present at the radio site. 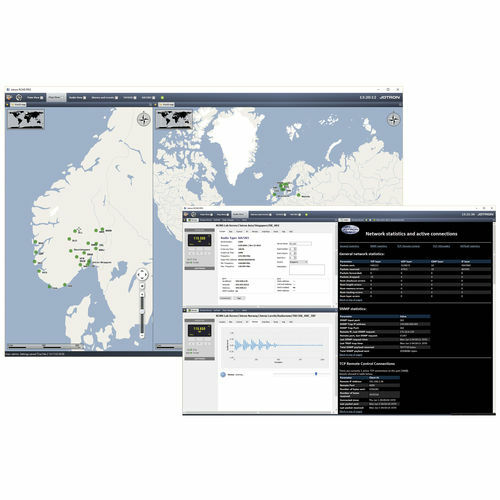 Together with the comprehensive reporting tool built into the RCMS system, this saves time and energy for the operators of the radio network. Various configurations are possible from the simplest solution that monitors 1 radio to a nationwide system that monitors 100s of radios using a single or multi server configuration. The radios in the network do not require any additional hardware or software to be controlled, they already include necessary firmware to be controlled using SNMP v3 or lower from one or more (redundant) servers. The Jotron RCMS system is designed to remotely access, monitor and control ATC and coastal communication equipment from Jotron AS. Currently the products that can be connected, include: Radios, radio gateways and ICU in the Jotron 7000 series. Any computer that has access to one or more of the RCMS servers, can access, monitor and control connected equipment by logging in to the server. The user privileges gain the right access to the equipment. The server and control store all information as it arrives from the radio as SNMP traps contain a database with historical events. Databases stored on the server allow the generation of reports and historical statistic information reports to document the availability of the communication system.